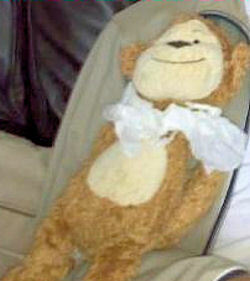 I am desperately searching for my daughter’s monkey. He was her favorite toy and was last seen at the beginning of the week. We cannot find him, and I suspect someone picked him up. My daughter went out for a walk with her Nana around our local lake last week, and took her beloved Cheeky Monkey with her. When they returned home her Nana realized he was gone. We retraced steps and phoned shops, but it was no good. Cheeky monkey went everywhere with Erin…on holiday…to the shop…even in the bath on occasions! She has been asking where he is, so I have told her he’s on holiday. I cannot find a replacement monkey because it has been discontinued and none of the North East stores have it in. He is roughly 35cm (14 inches) tall and has long arms and legs and a tail. He has a big smile, and he’s brown, with a cream face and tummy. I bought him sometime in 2007 at the Sunderland Mothercare. I rang every Mothercare store in the North East and emailed the customer services. They replied saying it has been discontinued, and I cannot find it on eBay. If anyone has an unwanted monkey the same as Cheeky Monkey I will willingly take it off their hands! !